Francisco Cervantes de Salazar (1514-1575) was a Spanish academic who travelled to Mexico around 1550 where he was twice elected rector of the newly established University of Mexico. 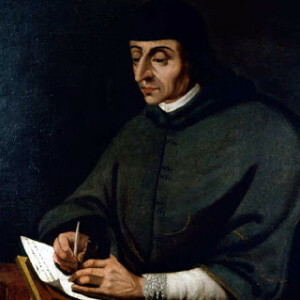 In his Crónica de la Nueva España he was a firm supporter of the idea of interpreting Plato’s 9,000 ‘years’ as lunar cycles, echoing the earlier statement of Eudoxus of Cnidos. Stephen P. Kershaw has noted[1410.161] that Salazar, along with many others, was strongly influenced by the opinions of Marsilio Ficino.